All aboard the peat train to Ardmore. Picking a location to distill Scotch Whisky is an art in itself and one where Ardmore’s founder Adam Teacher has triumphed. The distillery is located at the top end of the Northern Railway Line in the Scottish Highlands, ensuring Ardmore could immediately flourish by transporting their product to cities with speed and ease. You then, of course, need a great source of water. Since day one of production water has been drawn from the natural springs of the Knockandy Hills. For these reasons very little has changed about Ardmore since it started distilling back in 1898. But then again, when you got your location so right, why would you? 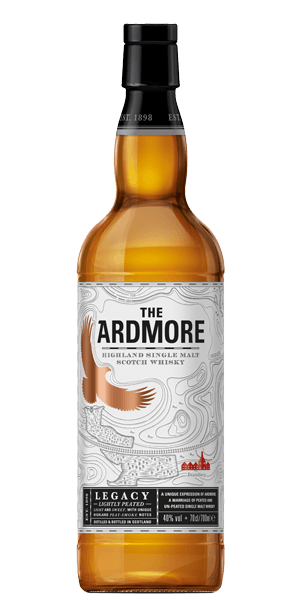 Here we have the entry-level Whisky of the Ardmore range. A Highland Whisky with a mix of 80% peated malt and 20% unpeated malt. This dram is definitely not for a drinker who is opposed to a bit of Smoky spice in their Scotch. All things considered however this still falls into the easy-drinking category of peaty Whisky, an ideal dram to test the waters with smoky flavor. The makers declare that this Dram embodies their natural Highland Spirit so embrace your inner Scot and get yourself a bottle of this reasonably priced Malt. What does Ardmore Legacy taste like? The Flavor Spiral™ shows the most common flavors that you'll taste in Ardmore Legacy and gives you a chance to have a taste of it before actually tasting it.